Dynamite Entertainment Announces Bionic Woman Comic Book! 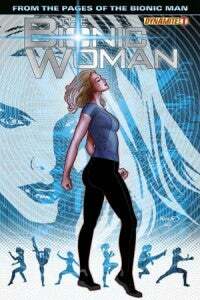 Following the success of their popular The Bionic Man ongoing series, Dynamite Entertainment is releasing The Bionic Woman #1. Written by Paul Tobin and drawn by Leno Carvalho, with an amazing cover by Paul Renaud, The Bionic Woman #1 hits stores in March 2012! The Bionic Woman ongoing series is licensed through NBCUniversal Television Consumer Products Group. Paris is the City of love? Not anymore... not since Jaime Sommers, The Bionic Woman, came to town hot on the trail of "The Mission", a collection of insanely high-priced surgeons who've been murdering OSI's bionic prototypes in order to provide new life for billionaire patients. But while "The Bionic Woman" is hunting The Mission, its #1 hunter is after her! Can Jaime pick up the pieces of her past while protecting her life in the present, or will the City of Love turn its back, and its bullets, on The Bionic Woman? Acclaimed writer Paul Tobin brings you a tale of baguettes, bullets, and bionic badass! Be sure to get The Bionic Woman #1 in March 2012! "It's a big booming blast of a look at the woman behind the bionics," says writer Paul Tobin. "…a chance for myself and Jaime Sommers to team up, cut loose, knock some things around and then high-five when the dust is still settling." "We are very happy to be working with Paul, and have a few other things in the works with him," adds Dynamite President and Publisher Nick Barrucci. "He's made a name for himself producing solid comics and now that The Bionic Woman has come along, we think he's going to reach a whole new audience. We welcome fans to come along for the ride!" "The Bionic Woman" is an American television series, from Universal Television, that aired for three seasons between 1976 and 1978 as a spin off from "The Six Million Dollar Man." Lindsay Wagner starred as tennis pro Jaime Sommers, who was nearly killed in a skydiving accident. Sommers' life was saved by Oscar Goldman and Dr. Rudy Wells, with "bionic" surgical implants similar to those of The Six Million Dollar Man, Steve Austin. As the result of Jaime's bionics, she has amplified hearing in her right ear, a greatly strengthened right arm, and stronger, enhanced legs which enable her to run at up to 60 miles per hour.